Ernest George Cox was born on 4 April 1898 in Yeovil, the son of general labourer Francis George Cox, known as Frank, (1869-1945) and Ellen Jane née Warr, known as Nellie, (1873-1951). In the 1901 census Frank and Nellie were listed living at 59 Kiddle's Lane (today's Eastland Road) with their children Ernest and Bessie, aged 2 and 8 months respectively. By 1911 two more children had been added to the family, Harry and Gladys, and the family had moved to 2 Camborne Terrace, Camborne Street. Sadly we know little of Ernest's career in the Royal Navy although it is known that he served aboard HMS Black Prince as an Ordinary Seaman. HMS Black Prince was a Duke of Edinburgh-class armoured cruiser built for the Royal Navy in 1903. She was stationed in the Mediterranean when the First World War began and participated in the pursuit of the German battlecruiser SMS Goeben and light cruiser SMS Breslau. After the German ships reached Ottoman waters, the ship was sent to the Red Sea in mid-August to protect troop convoys arriving from India and to search for German merchant ships. After capturing two ships, Black Prince was transferred to the Grand Fleet in December 1914 and was sunk during the Battle of Jutland in May 1916, with all hands killed. The Battle of Jutland was a naval battle fought by the Royal Navy's Grand Fleet against the Imperial German Navy's High Seas Fleet. The battle was fought on 31 May and 1 June 1916 in the North Sea near Jutland, Denmark. It was the largest naval battle and the only full-scale clash of battleships in the war. Fourteen British and eleven German ships were sunk with 6,094 killed and 674 wounded on the Allied side and 2,551 Germans killed and 507 wounded. The circumstances under which Black Prince sank were mysterious for some years after. As the British had lost contact and did not see the ship destroyed, but recent historians, however, hold to the German account of the ship's sinking. Black Prince briefly engaged the German battleship Rheinland at about 23:35 GMT, scoring two hits with 6-inch shells. Separated from the rest of the British fleet, the Black Prince approached the German lines at approximately midnight. She turned away from the German battleships, but it was too late. The German battleship Thüringen fixed the Black Prince in her searchlights and opened fire. Up to five other German ships, including battleships Nassau, Ostfriesland, and Friedrich der Grosse, joined in the bombardment, with return fire from Black Prince being ineffective. Most of the German ships were between 750 and 1500 yards off the Black Prince - effectively point blank range for contemporary naval gunnery. Black Prince was hit by at least twelve heavy shells and several smaller ones, sinking within 15 minutes. There were no survivors from Black Prince's crew, all 857 being killed on 31 May 1916, including Ernest Cox who was just 18 years old. 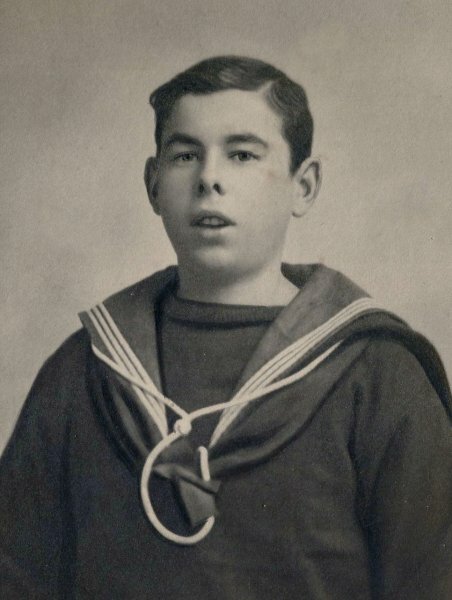 Another Yeovil man killed on the same day at Jutland was Petty Officer Ernest Diment who went down with HMS Indefatigable. On 9 June 1916 the Western Gazette reported "Townspeople generally will regret to learn that a number of Yeovilians were on the various ships sunk on Wednesday last in the battle off the coast of Jutland and, amongst them, being Able-seaman (sic) E Cox of the Black Prince, whose relatives reside in Camborne Street." 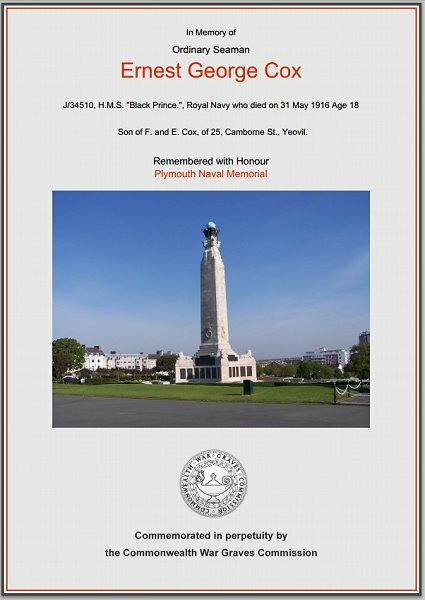 Ernest Cox's name is recorded on Panel 12 of the Plymouth Naval Memorial and is also on the Yeovil War Memorial in the Borough. The Commonwealth War Graves Commission certificate in memory of Ernest Cox.